Rachael O’Meara was a customer support manager at Google when she realized she was burned out and needed to reassess her path. She felt the best way to do this was to take a “pause”—a time-out to create space for her inner voice to be heard and to align her actions to lead a more fulfilled life. In PAUSE, Rachael weaves in psychology, existentialism, and neuroscience-based research to explain how pausing can boost your emotional intelligence and ability to act, feel, and communicate authentically and responsibly. 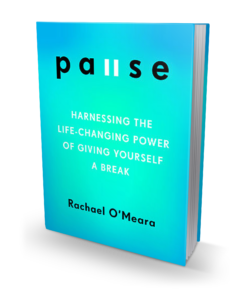 Drawing on her personal pause story, as well as that of many others, Rachael guides readers in creating their own “Pause Plan,” regardless of how much time, money, or resources they have. Further, she explains the different ways you can learn to meaningfully pause—whether for 60 seconds a day, an hour, a week, or over the course of several months—and discover what you value most and lead a satisfying and fulfilling life that you choose.